Galen was the greatest physician of ancient Rome. 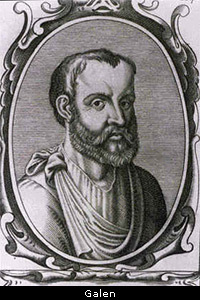 Whereas Hippocrates laid the foundation of Greek Medicine, Galen further developed its theory and practice, and carried Greco-Roman medicine to its zenith. Claudius Galenus, or Galen, was born in Pergamum, an old Greek city on the Aegean coast of Asia Minor, or present day Turkey, in the year 130 A.D. Pergamum was an ancient center of learning and medicine, having an Asclepion and a famous library that second only to the one in Alexandria. Galen was born into the lap of luxury, which afforded him ample time to study. His father Nicon, a wealthy architect, quickly recognized his son's brilliant mind and took a keen interest in his education, hiring the best tutors in all the arts and sciences. When Galen was just a boy, his father had a dream in which Asclepius appeared to him and told him to let his son study medicine. And so, the young Galen went to the local Asclepion to be trained by its elder physician-priests. Galen remained a lifelong devotee of Asclepius. When Galen was 19, his father died, which sent him on the journeyman phase of his medical education. He first studied in Smyrna, or present day Izmir, Turkey, and then traveled to Alexandria, where he finished his studies. His medical training in Alexandria made him an empiricist. Galen's first post was as a physician and surgeon to the gladiators in Pergamum, which gave him considerable skill and knowledge in the fields of anatomy and surgery. From there, he went to Rome, where his great skill and ability quickly attracted the attention of the influential and elite. Galen became the personal physician to the emperor Marcus Aurelius. Galen was a master of medical philosophy, and considered the study of philosophy to be essential to a physician's training. Philosophy enables the physician to discern between truth and illusion, or between reality and mere surface appearances, which is so important in diagnosis. It's also necessary for putting treatment on a sound ethical foundation. Although he wasn't a Christian, Galen was a monotheist; he believed that the body was the physical vehicle for the indwelling soul. Galen's monotheism greatly enhanced the acceptance of his medical theories and teachings by later generations of Muslim and Christian scholars and physicians. Galen's chief contributions to the theory of Greek Medicine were his theories of the three varieties of pneuma, or vital energy, and the Four Faculties of the organism. He also developed and expanded the humoral physiology and pathology of Hippocrates. Proper organ function was very important to Galen's views on anatomy and physiology. He tended to view health as the balanced, harmonious, optimal functioning of all the organs and systems of the body. Galen believed in the Aristotelian doctrine that, in Nature, form follows function. If we want to understand the function of an organ, tissue or body part, we must first study its form. That's why Galen considered anatomy to be so important. Galen was fanatical in his pursuit of anatomical knowledge. He conducted dissections and vivisections on animals, chiefly apes, to figure out by inference and experiment how the human body was structured, and how it worked. By clamping the ureters of living apes and watching the kidneys swell, Galen concluded that the kidneys produce urine. By cutting or stimulating various spinal nerve roots, he figured out which organs and muscles they controlled. Galen is most admired by modern medicine for being a brilliant anatomist who was way ahead of his time. Living so long ago, with so little previous knowledge to go on, it's amazing what Galen figured out; in fact, he almost got it all right. In pharmacology, Galen developed a system of Galenic degrees, which enabled physicians and pharmacists to gauge more precisely the effects of a medicinal substance. In the preparation of medicines, Galen considered increased quantity to be a poor substitute for poor quality of the ingredients. Galen personally visited the exotic locales where many key ingredients of his medicinal formulas were produced to better understand matters of quality. 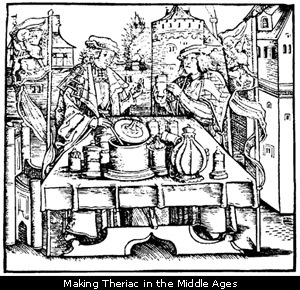 Galen's most famous medicinal formula was Theriac, an herbal jam or electuary with some 64 differnt ingredients that was a virtual panacea or cure-all for many diseases, and an antidote to many poisons. Theriac's use and manufacture continued until the late 19th century. Since Venice was a key center for its manufacture, it is sometimes called Theriac Venezian, or Venice Treacle. Today, Theriac Venezian is a key ingredient in Swedish Bitters, an herbal elixir popularized by the Austrian herbalist Maria Treben. Galen was also an expert on the pulse; many consider him to be the originator of pulse diagnosis. He wrote a treatise on the subject, entitled De Pulsibus. Being a lifelong devotee of Asclepius, Galen was a firm believer in the healing and diagnostic power of dreams. He even wrote a treatise on the medical interpretation of dreams. Galen was a prodigious author, and wrote some 80 different medical treatises. Today, many of them have been lost. Galen is often criticized for being egotistical, but perhaps in his case it was well-deserved. His writings are full of long-winded refutations of his rivals and critics, whose partial knowledge and fallacious reasoning he despised. Galen considered the profit motive and the love of money to be the worst reasons for becoming a physician. Being independently wealthy, money mattered little to him. He was only after two things: dedication to relieving the suffering of humanity and the pursuit of medical excellence. For over a thousand years after his death, Galen, with his prodigious accomplishments, was considered to be the gospel truth, the ultimate authority on all matters medical. Medieval medical authorities dogmatically agreed: If Galen figured it all out, why look any further? This was indeed to prove a mixed blessing for the history of medicine. It wasn't until the Renaissance that Galen was finally questioned and his errors uncovered. Galen's Hygiene (De Sanitate Tuenda) Translated by Robert Montraville Green, M.D.